Y’all, this is a weird series. I’m enjoying it, I think, but it’s hard to explain. 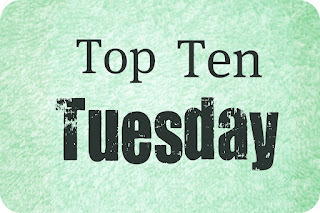 Top Ten Tuesday is hosted every week by the folks over at “The Broke and the Bookish.” Book recommendations. They are tricky. I love it when someone recommends a book to me, since I love to read and will read just about anything, regardless of genre. I’m pretty open minded when it comes to my reading choices, but I know most people aren’t. Still, I do enjoy recommending books, just to try and bring new stuff to people, stuff they may not have picked up otherwise. At the beginning of this year, my husband asked me to recommend twelve books for him to read, one for each month. I was elated! I was so proud! I had no idea what to pick! In the end, I came up with a list that shows just how strange and varied my reading can be. Here they are, in no particular order. 1. Feed by Mira Grant – This book blew me away so much, I wanted to share the experience. 2. Maus by Art Spiegelman – Read this in college and it’s still the best story about the Holocaust I’ve ever read. Plus, we need more graphic novels. 3. Ender’s Game by Orson Scott Card – Partly because we were going to see the movie, partly because it was one of my favorite books as a kid. 4. Never Let Me Go by Kazuo Ishiguro – Another book that blew me away, although for completely different reasons. Another college read. 5. The Mists of Avalon by Marion Zimmer Bradley – I love a good Arthurian story, and this one is one of the most unique. 6. Harry, A History by Melissa Anelli – A memoir about being in the epicenter of the Harry Potter fandom. A must read for HP fans everywhere. 7. Without You: A Memoir of Love, Loss and the Musical RENT by Anthony Rapp – A must read for musical theater fans. 8. Ready Player One by Ernest Cline – One of my favorite books of the past couple years. A scavenger hunt through the largest video game ever created? Yes please! 9. Looking for Alaska by John Green – Needed some YA on this list and who better than John Green? 10. The Name of the Star by Maureen Johnson – See my comment for John Green. Plus, this one is a little spooky, which only makes it more fun. 11. A Game of Thrones by George R.R. Martin – Put this one on the list for several friends of ours who had been bugging my husband to read it for years. Well, now he has to. Plus, it’s amazing. 12. Frankenstein by Mary Shelley OR Dracula by Bram Stoker – He hadn’t read either of these, so I let him pick one. Classics of the horror genre and both really good stories that have been perverted by popular culture. Let’s get back to the real stuff, shall we? Please leave your teasers and top ten lists in comments! Excellent recommendations for the person that doesn’t read that much. Kathy is reading “Frankenstein” which she’d never ready. Astounded was my response. Kaitlin, who reads not, requested both “A Fault IN Our Stars” and “Looking For Alaska”. I’m currently reading “Proxy” by Alex London, “Legend” by Marie Lu and “The Ocean at the End of the Lane” by Neil Gaiman. Yes, I have attention span problems and cut through the book reading with comic reading. Yossel by Joe Kubert is another good Holocaust GN with superb Joe Kubert art. Mr. Kubert passed away last year, but his two sons carry the torch. Yep, Michael hadn’t read Frankenstein either. Or Dracula. Of the two, he decided to read Dracula, so I might put Frankenstein on the list for next year. The Fault in Our Stars is an amazing book, as is Looking for Alaska, but buy Kaitlin a box of tissues to go with both. She will need them. Haven’t heard of Proxy, but I added Legend to my TBR after hearing Marie Lu speak at YALLFest. And anything by Neil Gaiman is a good choice. That man is awesome. Brilliant recommendations Denise! I hope he’s enjoying them! For the most part, he’s enjoyed what he’s read so far, some more than others. I was trying to give him a wide spectrum. The thing that makes me happy is that he wants me to do this again next year! I need to start putting together a list now! I was surprised too, but it worked out well. Next year I’m asking him for the same thing, only with movies. I don’t see many, so there are a lot over the years that I’ve missed. Great list! I love the diversity! I am a diverse reader too, so I love when I see that others are as well. I have read Dracula, Ender’s Game, and Never Let Me Go. Looking For Alaska is on my list to-read, but I think I’ll be adding Feed to that list as well. The only problem with being a diverse reader is that your TBR is usually exponentially larger than other people’s because there are very few books that you automatically rule out. Wonderful recommendations! I am behind on the Dashner series. They’ve been pretty good so far. It’s an interesting premise, nothing I’ve really seen before, which is always nice. Good teaser. Sometimes I feel like it won’t be long before I go crazy! So I can relate.